Mohammed Habib has been stuck in Oman for the last two years. He possesses no valid documents, and in the past few months has had no proper employment, food nor shelter. Mohammed, a Bangladeshi migrant, sees no light at the end of the tunnel. “Each and every day, survival itself is a big hurdle. No money for food, medicine and shelter. In addition to all of this, as I don’t possess any legal documents, it’s quite difficult to make an exit from Oman. As I am overstaying, the fines for the same are huge,” Mohammed said. “Currently, I am surviving by arranging money from Dhaka. For OMR95, my relatives pay 20,000 Bangladeshi Taka. With that I will be able to survive for at least two months. How long I can continue here like this. I came to earn and remit money. Now, the other way is happening,” Mohammed added. Mohammed’s case is not an isolated one. 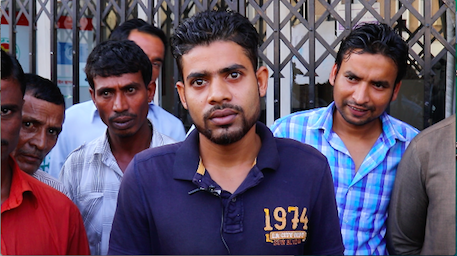 Hundreds of Oman's migrants have similar stories, especially in Muscat. The majority are ‘free visa’ workers. They work for daily wages for whoever hires them, which is considered illegal under Oman’s labour law. Many blue collar workers, especially from Bangladesh, come to Oman on this so-called ‘free bisa.’ Workers pay a fee to their sponsor, at least OMR20 every month, in order to work freelance. To enter into the “free visa” scheme, workers first shell out around OMR1,200 (about US$ 3100) through agents (see also: Kafala as a business, kafeel as a career). The 'free visa' has no legal construct or protection. Exploitation is a risk, as employers know they can’t be reported for unpaid wages or poor working conditions. Some workers find the 'free visa' advantageous because it can allow them to earn more money, even double the amount they would earn with a single employer. 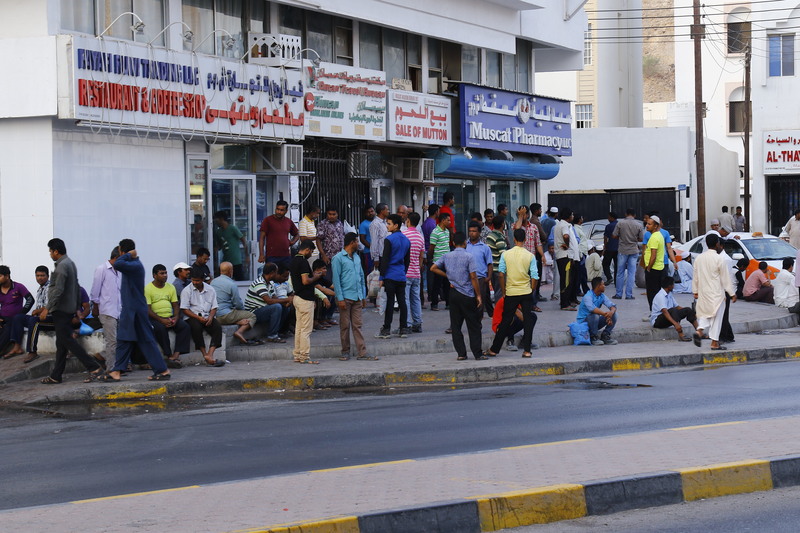 Recent reports from Oman’s Manpower Ministry indicate that around 10,000 ‘free visa’ workers were caught in ‘raids’ in the first six month of 2016. During July and August, around 2,700 workers were arrested according to a ministry tweet. Oman Labour Law Article 114 states that a non-Omani employee who works in Oman, without a licence from the concerned directorate, or works with any employer, other than the employer who obtained a licence to bring him to the Sultanate, shall be punished. According to ministry data, 19,056 labour law violators were arrested in 2016. 13,172 were Bangladeshis, 1,728 were Indians and 2,913 were Pakistanis. The remainder were designated as other nationals. Out of the 19,056 arrested, 9,389 were deported. But the economic downturn has hit the ‘free visa’ workers hard. Daily work is not as easy to come by, as projects have stalled. Without work, they can’t pay the monthly fee to sponsors. This prompts the sponsor to file an absconding case, putting workers in an even more precarious legal situation. Every day, from 5 a.m. till 11 a.m, they wait on the streets to be hired. However, work opportunities have dried up over the last few months, forcing many return to their cramped shelter with little more than hunger pangs. “It is a terrible situation. No work at all. Don’t know how to survive,” says Abdul Ahmed, another Bangladeshi worker stranded without proper documents for the last 10 months, said. “I am not well too. I can’t even access medical care without a proper visa,” Ahmed added. An expat who has overstayed their visa must pay around OMR20 (USD $52) for visa charges at the airport immigration counter and OMR19 (US $50) at the Ministry of Manpower counter for every month they’ve remained in Oman since the visa expiration (capped at 25 months or OMR500). If there is an absconding case against the worker, then he must pay an extra OMR400. For Habib, the fine would be around OMR1,000 (about US $2600). Even though there is a dearth of work in Oman, statistics issued by the Bangladesh Manpower and Employment and Training (BMET) showed that 146,257 Bangladeshis officially migrated for employment between January 1 and October 2, 2016. Around 27% - between 15,000 and 17,000 - came to Oman, while roughly 17% migrated to Qatar. Mohammed Irshad came to Oman in June after paying OMR1,500 (around USD $3900) for a ‘free visa’. “I came to work for Oman in June. I was told that I can work anywhere. But where is work? I paid a huge amount to get the visa. Now, no hope at all,” Irshad added. Between January and August 2015, Bangladesh received US $628.86 million in remittances from Oman, while this year, it was only US$603.04 million for the same period.